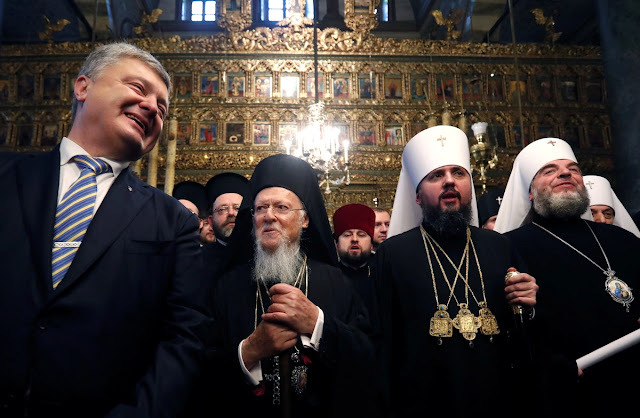 The delivery ceremony of the Tomos of autocephaly yesterday in Istanbul had a strongly "national" character, with Poroshenko sitting next to the altar, together with his family and various ministers. For Ilarion and Chaplin of the Moscow Patriarchate, Bartholomew is "schismatic" and "heretic". The possible rejection of the Polish, Serbian, Czech Orthodox Churches. In Ukraine religion is intermingled with national politics, as in Russia. Today Christmas celebrated in the cathedral of Kiev. Fears of possible struggles for the possession of ecclesiastical structures. Moscow (AsiaNews) - The new autocephalous Ukrainian Church is a reality, consecrated by the Tomos of autocephaly delivered in a solemn liturgy yesterday, January 6, on the eve of the Orthodox Christmas, in the small church of the Phanar in Istanbul. For one day the small structure of the patriarchate of Constantinople became the true center of media attention for the 250 million Orthodox in the world. The celebration was co-chaired by the Patriarch Bartholomew (Archontonis) together with the new metropolitan of Kiev Epifanyj (Dumenko). Also present was Ukrainian President Petro Poroshenko, for whom the "imperial" chair next to the altar was reserved, together with his wife Marina and his sons in the Ukrainian national costume, the ex-president Viktor Yushchenko, the president of the Verkhovnaja Rada, Andrij Parubij and Defense Minister Stepan Poltorak. The "national" and not only religious character of the ceremony was evident, putting a strain on the nerves of the historic Muscovite adversaries. The delivery of the Tomos sanctions the divorce between the patriarchate of Moscow and that of Constantinople, after many centuries-old quarrels. The most radical exponents of the Russian Church, such as Metropolitan Ilarion (Alfeev) and Protoierej Vsevolod Čaplin, would like an open condemnation of Bartholomew as "schismatic" or even as "heretical", but the Synod presided over by Patriarch Kirill (Gundjaev) has limited itself for now to the interruption of Eucharistic communion, pending further developments. The break, however, appears difficult to rebuild, at least in the immediate furture. Even the head of the Polish Orthodox Church, the metropolitan of Warsaw Savva (Hrycuniak), has added his complaints to those Muscovites, sending a letter to Constantinople criticizing Ukrainian autocephaly, which instead of resolving the schism further aggravates it. The Polish Orthodox Church, like that of former Czechoslovakia and the Serbian one, has always been very close to the sentiments of Moscow. In fact, with the conclusion of the autocephalous process, religion assumes a pre-eminent social role in Ukraine, directly inspiring national politics. The former Soviet republic, which broke away from Moscow in 1991, is only mimicking the dynamics of Russia itself, which in the marriage between the Putin presidency and the leadership of Patriarch Kirill has rebuilt its national self-consciousness in the last 20 years. The difference is that in Ukraine one can speak of "orthodox nationalism"; instead the Russian ambitions are rather "imperialist" and supranational. The consequences of the "religious" radicalization of the former Communist countries could lead to internal conflicts in Ukraine, where a strong competition for the appropriation of different ecclesiastical structures (parishes, monasteries, cultural and social institutions) is expected in the coming years (if not decades) ). At the same time there is a long phase of opposition between Moscow and Constantinople in the world Orthodox diaspora, which will inevitably involve the faithful of other nationalities (Moldavians, Romanians, Baltics, Balkans), often aggregated to the churches of the "dominant" patriarchate. According to the script prepared by Poroshenko, today, the feast of the Orthodox Christmas now provides the "birth" of the new Ukraine, in another spectacular celebration at the St. Sophia Cathedral in Kiev, returned to the function of primatial church. Tomos will be shown as a Christmas gift, granted according to the official text from the "Center of Orthodoxy" to be preserved "in eternity" to testify of the canonicity of the new Church. It is the beginning of a new era of universal Orthodoxy, divided between the "federalist" Constantinopolitan era and the "autonomist" one led by Moscow. And it will be to be seen how they will resist the claims of the various political leaders who, even if long lasting, never remain "forever".